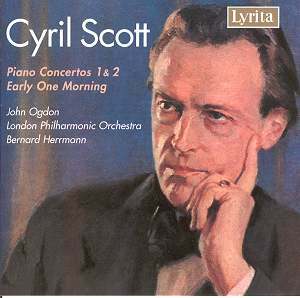 With two orchestral collections already out from Chandos and a third on the bench Cyril Scott’s music is at last making its way. He died nine years short of his centenary. Had he lived to experience that iconic event he would have seen a couple of articles and very little else. In the 1980s things moved on a little as it did for his copains Granville Bantock and Josef Holbrooke. For Scott this took the form of a rather lacklustre orchestral collection from Marco Polo. Since then there has been a Chris Howell anthology of piano solos on Tremula and three double CD sets of the solo piano music played by Wilfred De’Ath on Dutton. The BBC broadcast the one act opera The Alchemist as well as the choral piece La Belle Dame Sans Merci and most recently the Violin Concerto, itself rumoured to be included on the next Chandos Scott volume. Latterly the real impact on the musical public’s consciousness has come from those two Chandos collections which in repertoire terms substantially overlap the present disc; the only completely new works there being the symphonies 3 and 4 and Neptune. There’s no direct competition between this disc and the Chandos pair. Lyrita have here gathered the contents of two LPs issued in 1975 and 1977 giving us Scott’s principal output for piano and orchestra. The recordings were the result of a volatile collaboration between Richard Itter, John Ogdon and the irascible Anglophile conductor and composer Bernard Herrmann. Do not expect from these three works frank heroics in the Tchaikovsky, Rachmaninov or Brahms mode. This is not solo pianist in adversarial contest with orchestra, pugilistic and then subdued. The First Piano Concerto was written just before the Great War. Beecham conducted at the premiere and the composer was the soloist. Latterly it was taken up by Kendall Taylor, Moura Lympany and Esther Fisher. The work is subtly perfumed with solo textures abounding and an overpowering atmosphere of mystery and idyllic lambency. After the Chinese hieratics of the first movement the second shares the enigmatic ritualism of John Ireland’s Legend and Forgotten Rite. The arcane beauties of the piece can be sampled in the dialogue of gong and celesta. Liquid Debussian touches create a meditative art nouveau kaleidoscope – a Klimt canvas in motion. The mood changes for the finale with its Handel-out-of-Grainger jocularity. The beguilingly glittering waywardness of the First Concerto can also be heard - though with none of the oriental edge - in Early One Morning. The folksong itself is for the most part deeply subsumed, rising in enchanting Copland-like mist at 4:18. It is most clearly limned by the piano at 5:03 onwards. This is by no means the sort of conventional variations on a theme that Stanford produced for Down Among the Dead Men. The recording sessions were the first performance of the revision for single piano and orchestra. The original was for two pianos and orchestra. The Second Concerto cannot be precisely dated but it is known that the composer was working on it in 1956. It is quite short and is in three movements. A tougher nut than the First Concerto, its themes are more subtle. Its haunted swaying harmonic world recalls an overgrown, lichen-festooned castle. Herrmann’s Xanadu was perhaps an influence; I wonder if Scott saw Citizen Kane? More plausibly we might hazard that the concerto was influenced by Debussy’s Pelléas et Mélisande. There is a positively Baxian war-dance trope at 00:32 in I. Otherwise the stylistic links are as with the other works: with the last two piano concertos by Nicolai Medtner, the Symphonic Variations of Arnold Bax (contemporary with Scott’s First Piano Concerto) and with John Foulds’ Dynamic Triptych and Essays in the Modes. The cover of the CD booklet is a detail from the cover of the LP SRCS81: a portrait of Scott at age 52 painted by George Hall Neale. This is a generously timed disc presenting Scott’s subtly beguiling piano concertos. The first is the more instantly captivating of the two but the second has much to commend it. Superbly done.